Fans of our Layout And Background series (which you can see here, here, and here...) will be happy to know that Adam recently bought me the Design book from the same Walt Disney Animation Studios Archive Series! This book differs strongly from Layout And Background...which focuses on the fairly obvious title. The Design book n features both character development, but also the evolution of the "look" of the movie. I am seriously psyched to have this in my possession. The first installation is both random and fabulous. I literally opened the book up toward the middle, on a whim, and went with it. Here are two gorgeous character design sheets for the three good fairies from 1959's animated classic Sleeping Beauty. The fabulous thing about this book is opportunity to analyze the design process of the artists, and then compare to what we actually get on screen. 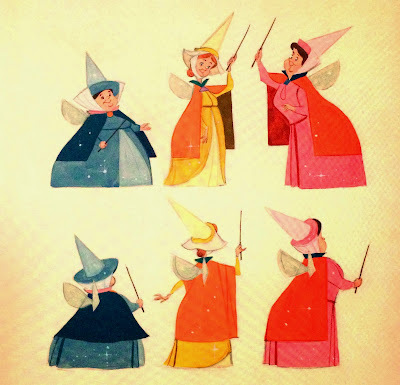 The first image was made very early in the development of the film, while these characters were considered much more ancillary. Though many would still consider them the comic relief of the film, the ended up much more refined. I hope you guys enjoyed these as much as I did. 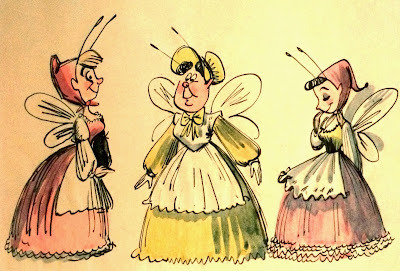 The three fairies are some of my absolute favorite, and deserve their rightful place in design history. Which fairy is your favorite? Or do you hate them altogether? Let us know over on Twitter!